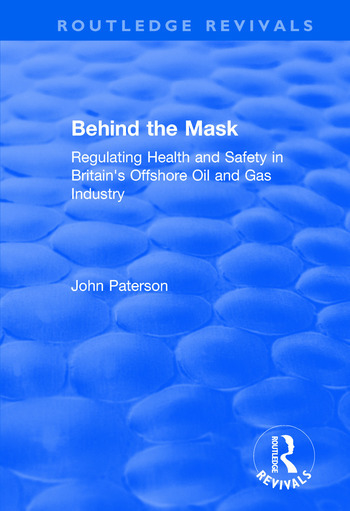 This title was first published n 2000: The most recent developments in occupational health and safety regulation in the UK’s offshore oil industry represent a departure from traditional legal forms. But how should they best be understood and what advantages do they offer over the previous regulatory approaches? Informed by autopoiesis theory, this study takes seriously the notion of an empirical field constituted by diverse communicative systems and thus traces the development of the industry along a series of dimensions including those of management and engineering as well as of politics and regulation. Adapting cognitive mapping, the book offers graphic demonstrations of the resultant constructive misunderstandings of regulatory and scientific signals and accordingly an alternative perspective on the nature of risk. The latest regulatory developments are shown to possess the potential to address these issues but only insofar as they are understood as distinct from previous legal forms and in particular as an example of reflexive law. Contents: Regulating and evaluating; Mapping a new approach; A long decade of determinism; The road to a new rationality; Reflexivity and risk; Appendix; Bibliography; Index. John Paterson is Reader in Law at the School of Law, University of Westminster, London, UK. He trained as a solicitor in the Office of the Solicitor to the Secretary of State for Scotland and holds a PhD from the European University Institute, Florence, Italy. He worked previously at the Centre de Philosophie du Droit, Louvain-la-Neuve, Belgium and is co-editor (with Olivier De Schutter and Notis Lebessis) of Governance in the European Union, Luxembourg: Office for Official Publications of the European Communities, 2001. He has acted as a consultant for the European Commission's Forward Studies Unit and the OECD Nuclear Energy Agency, and has published in the fields of risk regulation, corporate governance and legal theory.